One of the main responsibilities of Mr. Blog’s Tepid Ride is to inform and entertain. And we do that by mocking, sometimes mercilessly, those who deserve it. In this case, our honoree is a 92 year-old veteran of World War Two. This short letter was written to the New York Daily News (their motto: “We’re Going Downhill Fast and We Know It.”) I’m going to break from my usual policy of using names as this man, while he put his name out there intentionally, should probably be left alone at his age and I’m sure he doesn’t need legion of Mr. Blog fans (is two a legion?) assaulting him on the street. Hicksville, L.I. : As a 92-year-old Depression era baseball fan, I have fond memories of Babe Ruth and Lou Gehrig hitting homeruns out of Yankee Stadium. After three years as a combat veteran in the Pacific theater of WWII, I again was an enthusiastic Joe DiMaggio/ Ted Williams-era baseball fan. When Jackie Robinson joined the Brooklyn Dodgers in 1947, I believed then that baseball was truly the all-American sport. Today baseball is flooded with players earning millions of dollars who cannot speak a word of English and need interpreters when interviewed on TV. Even worse, the Japanese are now in the big leagues. After 60 years, I still have not agreed to peace with Japan, due to with the horrid memories of the wartime atrocities they committed still in my brain. In the twilight of my life one of my last pleasures, baseball is now gone. Well, I can certainly feel for him, right up to where he says today baseball is flooded with players earning millions of dollars who cannot speak a word of English and need interpreters when interviewed on TV. But then there’s a warning sign: Even worse, the Japanese are now in the big leagues. Uh oh, get ready for the racist rant. After 60 years, I still have not agreed to peace with Japan, due to with the horrid memories of the wartime atrocities they committed still in my brain. Funny, I don’t recall FDR asking if you agreed to peace with Japan. I’m pretty sure your signature was not required on the peace treaty. Were you even on the deck of the USS Missouri that day? I’m pretty sure you weren’t standing next to General MacArthur in that famous photo. However, and this is what worries me about this guy’s sanity, is the last line: In the twilight of my life one of my last pleasures, baseball is now gone. 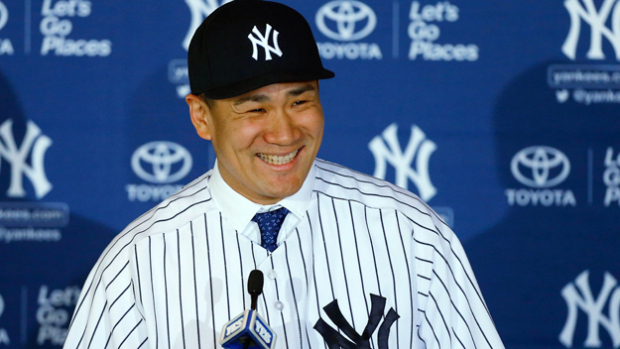 Tanaka is not the first Japanese player to join the Yankees. Has this guy forgotten that Ichiro Suzuki and Hiroki Kuroda already play for the Yankees? And what about Hideki Irabu, Hideki Matsui, Kei Igawa, and Ryota Igarashi, all of whom played for the Yankees in recent years? Seriously, he just now realized that there are Japanese players on the Yankees? Please, don’t take this guy to a sushi place or he may beat up the waiter bringing him his California roll. Two days and two blogs! Is this a return to form or just an aberration? We’ll see tomorrow! Unfortunately, a bunch of WW 2 vets share / shared the same sentiments, My own dad, a veteran of the Guadalcanal Campaign in the Solomon Islands, used the term ” Japs ” while he was reminiscing ( Didn’t express any overt hatred for them, though. ) Not saying it was right, just saying it happened. I totally get where that guy is coming from, but it is the timing of it that is weird. He just now realized that there are Japanese baseball players? And frankly, this player is far too young to have been in WW2, while this guy was, so the player could have a legitimate grudge against the old man! Now that I read the article again, yeah, the timing is kind of off. You’ve also got to take into account the man’s age. At 92 years old, he may not be flying with all his engines at full speed. My dad had dementia into his late 80’s & his mind was like a hard drive that had been put in an MRI. This guy, other than being cranky, seems to be flying on all jets. He is a regular in the NY Daily News opinion column and usually sounds like he’s all there. Well, then, he’s trying to fit the stereotype of the cranky old man. The VERY cranky old man ( At least where WW 2 is concerned ! )….. Ever heard of ” Cotton Hill ” ( animated character, ” King of the Hill ” TV series ) ? & done kilt fitty men, both ” Nazzies ” & Tojos ! Had his ashes flushed down a toilet used by Eisenhower ! Trouble is, they play a much less interesting version of the sport. Baseball is all station to station there, and taking an extra base is frowned on as bad form. Well, the carp is the most honorable of fish, right?